This portable optical power meter may be used to measure optical power (dBm) in premises, telco, or broadband fiber optic networks. When used with an LED or laser light source, the OPM1 can also measure the attenuation (insertion loss) of multimode or single-mode cables. 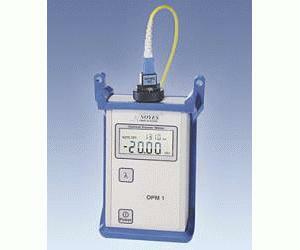 With only two controls – ON/OFF and wavelength – the OPM1 is our simplest to use optical power meter. Optical power in dBm and the calibration wavelength setting are displayed on an easy-to-read LCD display. The optical input port accepts Noyes thread-on style connector adapter caps. Adapter caps are required and must be ordered separately.